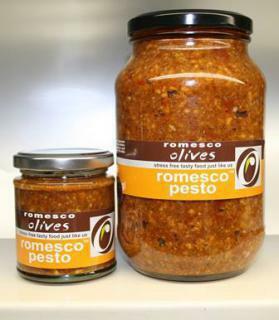 Romesco is an innovative company run by a bunch of food lovers. We specialise in marinating kalamata and green olives in extra virgin olive oil to different recipes in fact 26 of them. Firm favourites are the tangy kalamata, smoked campfire, herby greek moussaka, lemony tajine and the wonderful stuffed olives with feta, garlic, almond and lemon. We also make the amazing Catalonia pepper sauce called Romesco that gave its name to the business. The famous plump kalamata olives are grown in South Africa. We only ever use kalamata says Claire the founder of the company, we adore the bitter chocolatey taste and they are the finest table olive in the world. The very grassy extra virgin olive oil is pressed in the Cape exclusively for romesco and recently won a top award for one of the finest oils in South Africa. All the manufacturing takes place here in the cool Midlands where they have a a shop filled with the different olives, tapenades, sauces and oil. Come and see for yourselves. Leibrandt and Claire will be there to explain all things olivey and of course you will be able to taste the delicious recipes. Look out for the signboards directing you to the Midlands Business Estate. Dream AD Communications Co., Ltd.